I'm a big fan of the dark side (60's and 70's) period in stock car racing. These were the days before the slick aero bodies when the cars actually had to be a "stock" body. The makes and models of these cars were a lot more recognizable then and I think more fun to watch. Unfortunately, I was just a pup during this era so I never saw these cars run in person. For many years I didn't know much about this period in NASCAR but thankfully through the fantastic knowledge of the guys on Randy Ayer's NASCAR modeling board I've learned more about the cars that ran back in the day. It was on Randy's board that I first learned of the existence of the rare David Pearson '71 Pontiac GTO. 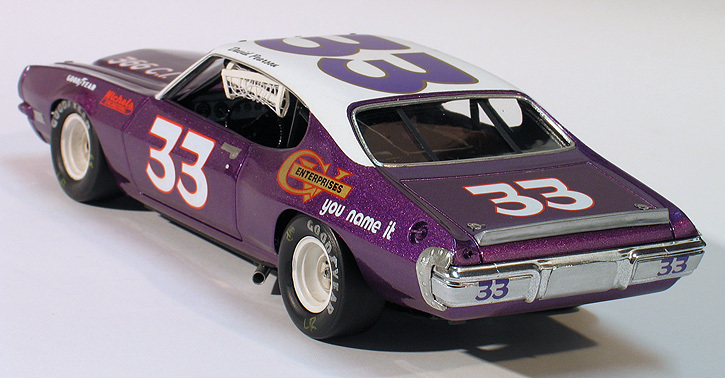 Apparently the GTO had a short lived career in NASCAR. 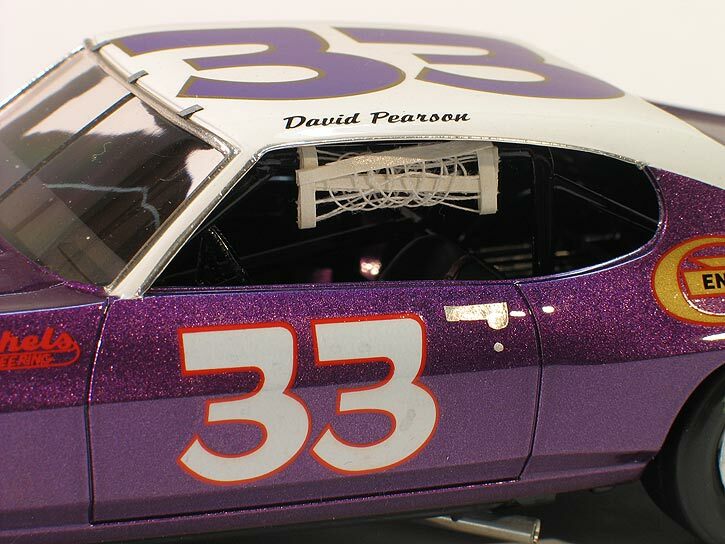 The car was built by car owner Ray Nichols and driven by Pearson during the '71 season. As Tom M. (one of the moderators over on Randy's board) writes, "the 366 displacement engine was due to a NASCAR formula in place in those days. NASCAR was making the transition from the so-called "racing" engines like the Hemi and Boss 429 so they ran restrictor plates at all tracks. The 7 liter Hemis and Boss '9's got the smallest plate, the 7 liter regular production style engines like Mopar wedges, 427 Chevys, and 427 Fords got a larger plate, and 6 litre production engines got the largest plate. 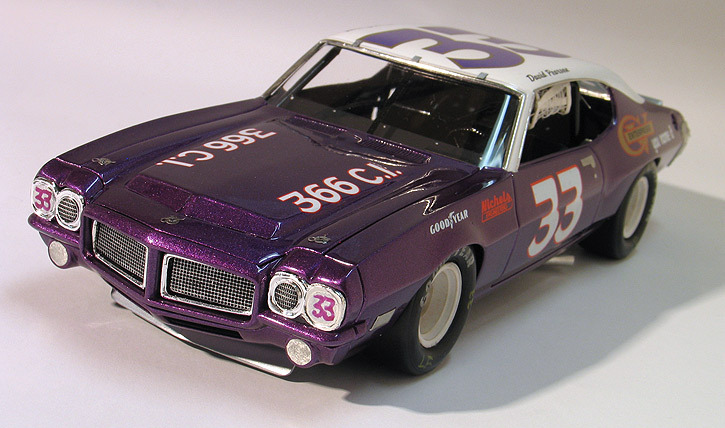 Pontiac and AMC developed engine packages specifically for the 6 litre (366 cubic inch) formula since they didn't already have a bunch of hardware in the hands of racers anyway." The engine apparently didn't live up to expectations and the car was only raced about a half dozen times. 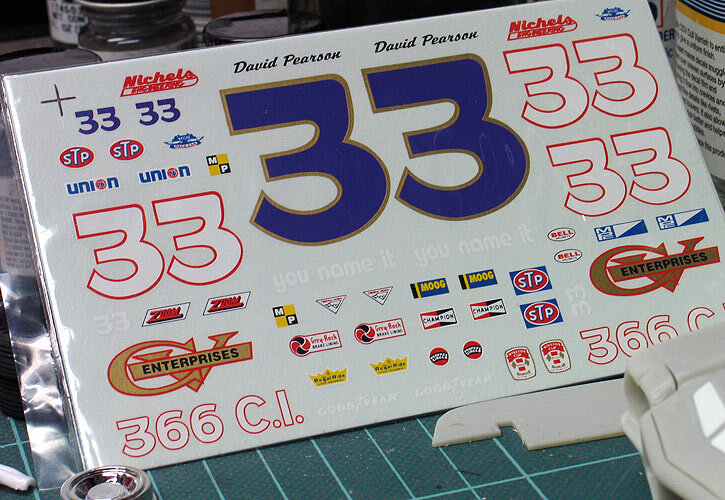 After seeing pictures of the car and learning there was a decal set available for the car I decided to build a replica of this unique piece of racing history. During my research I learned that MPC did actually create a model kit of this car during the '70's but then returned the kit back to it's stock configuration during the '80's. The current version was re-issued again in 2006. Not having the benefit of being able to find one of the rare original stock car version kits at a reasonable price I decided to convert the latest edition kit back to the NASCAR version. Using photos obtained on the web as a reference I first modified the body by opening up all four wheel wells with a Dremel tool and the front ones were reshaped with Bondo. I also Dremeled the back side of the wheel openings so they would have a more realistic scale thickness. The door handles & emblems were removed and the fender vents and turn signals were Bondo'd over too. The rear bumper in the kit was about 1/8" too wide for the body. I narrowed it, cutting it into three pieces and taking out a 1/16th inch section between each tail light. After everything was glued back together, I made tail light and licence plate covers using sheet styrene. 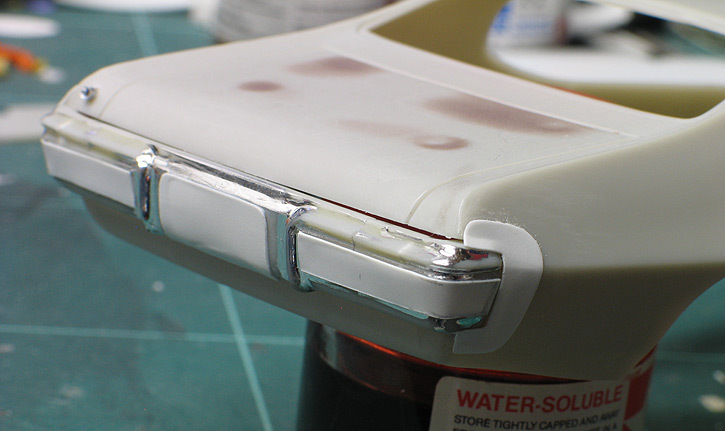 After some cleanup work, the finished bumper was painted with Alclad paint to restore the chrome finish. Styrene was also used to create the sheet metal fairings around the rear bumper. I also created the fuel filler and overflow tube from scratch. The rear spoiler was sourced from the MK re-issue of the '71 Cyclone stock car and cut down to fit the GTO's trunk. The front spoiler was built from scratch. The outermost headlights were ground out and replaced with a cover and the inner most headlights were painted to look like screened over ducts. The recessed grill was also modified so it would sit forward in the grill surround for a flusher fit and the hood scoop holes were covered with styrene. For a chassis I used the chassis and roll cage from the '71 Cyclone kit. This is the same universal chassis that MPC had originally included in all their vintage NASCAR kits. It's not totally accurate for the Pearson GTO but it fits well and was fine for a shelf model. It was mostly built using the parts from the box, but the suspension was modified so the car would sit with the proper stance. For wheels and tires I found a correct steel racing wheel in the Johan '72 Torino stock car kit and mated it to a Revell stock car tire. I then made a RTV rubber mold of the combo and cast a complete set in resin. I have plans to build several vintage stock cars using these wheels so it was worth my time to go through the casting process. 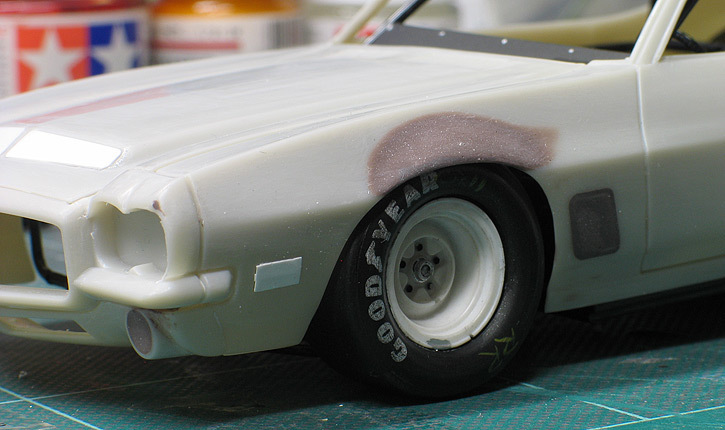 The tires were painted and later detailed using the Goodyear lettering I created for the '75 Laguna kit decals. 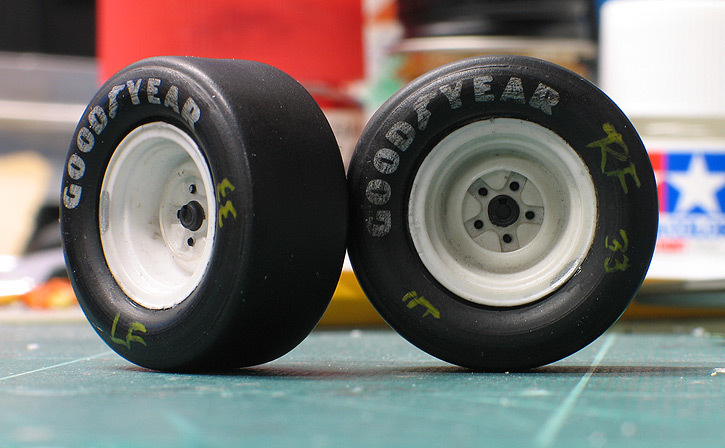 Afterward the tires were dry brushed with some flat black paint and various pastels to add a little weathering to them. 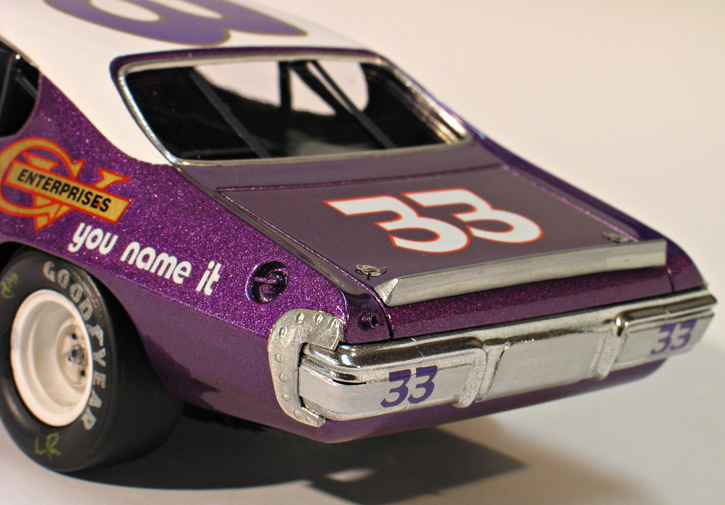 The body was painted using Testor's "plum crazy" metallic purple lacquer which is the correct color the real car was painted. The top was then masked and painted with Testor gloss white lacquer. For the number and sponsor graphics I used a decal sheet made by Dave Romero. These are nice quality silk screened printed decals that are unfortunately out of print. They can still occasionally be found on ebay though, which is where I got these. Afterward I clear coated the whole body with PPG concept 2000 urethane clear. Other details include a scratch built window net, window straps, alum. tube exhaust and photo-etched hood pins. 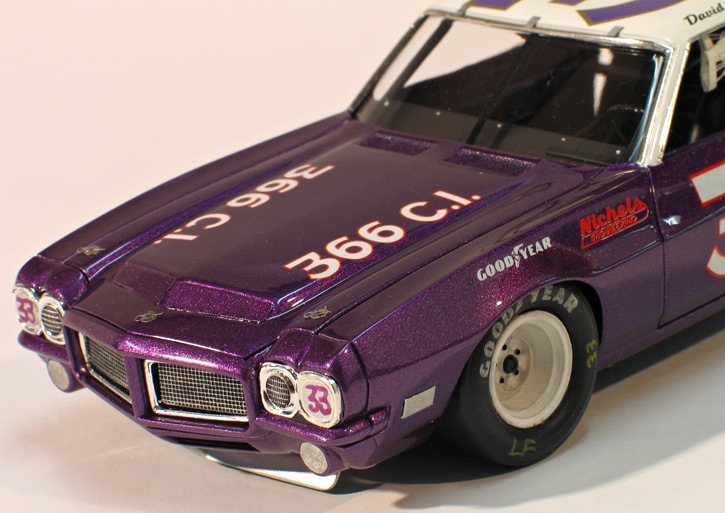 My GTO is just a simple curbside build but it fills a unique niche among my other NASCAR projects and I'm happy to have a replica of this piece of rare racing history on my shelf.